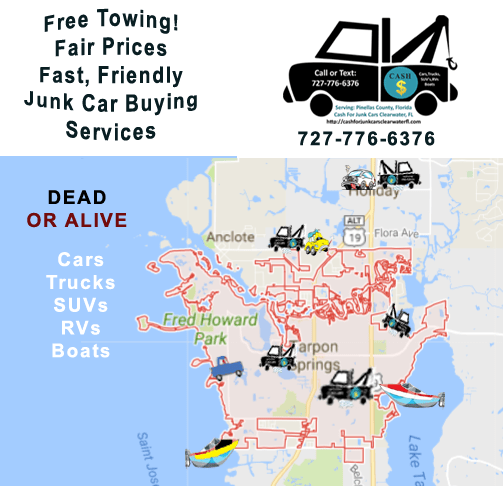 When You Junk a Vehicle or Boat in Tarpon Springs, FL with Cash for Junk Cars, You Get FREE TOWING! If you’re searching for a Tarpon Springs junk car removal service consider texting Cash for Junk Cars Clearwater, FL for an offer. We make the process of selling an old or unwanted vehicle easy, fast and painless. We accept the following types of automobiles and we also will buy your unwanted boat for cash! Cars – Unwanted, old, wrecked, running, dead or alive. We pay cash for junk cars, all makes, models. If we make you an offer, we tow it for FREE. Trucks – Need to junk a truck for cash in Tarpon? We’ve got you covered! We buy unwanted, old, wrecked trucks- Or, we’ll take them alive! SUVs – Junk your SUV in Tarpon Springs with ease. That’s right, when you want to junk your SUV whether it’s rusted, wrecked or running, we’ll make you an offer to pay you cash for your SUV. If you accept– we’ll tow it for free. Boats – If you have been having trouble finding a junk boat buyer in Tarpon Springs, FL you’re in luck. We buy unwanted junk boats in Pinellas County and throughout Tampa Bay. If you’re old, unwanted boat has turned into a lawn ornament, text us today for a cash offer for your old boat. Recreational Vehicles – Junk your RV in Tarpon Springs, Fl with us- We’ve removed many an old RV! Moldy, musty, wrecked, rusted or even running and in okay condition– We’ll make you an offer for your junk RV! What Can We Offer You for Your Junk Car in Tarpon Springs, FL? If Searching “junk my car in Pinellas County, FL” hasn’t turned up any great options so far, we hope you’ll give Cash for Junk Cars Clearwater, FL a chance to help. We have great, honest reviews on Google and Facebook! Let us help you junk that old vehicle or boat or remove an unwanted or abandoned vehicle from your property. We buy junk cars from St. Petersburg, FL to Tarpon Springs and beyond. Save money by ridding them of a vehicle they no longer want or drive but must insure in Florida. Put cash in their pockets when times were tough by buying an old or dead vehicle they had access to.